I realize that probably 99.9% of the people here are more into Rock than Bluegrass, but this is a genre that requires a lot of technical skill. Begins with the "G" run. Listen at about 25 secs. (although the mixtures are sometimes really great as well !).. As for BGrass, it in itself was intended as a modernization of the older folk styles w/ a definite slant on virtuosity. Proto-C&W-bebop or similar to what happened later w/jazz-rock, maybe, although it seems more trad since it generally stuck w/ a less adventurous harmonic skew. on TV outta Knoxville Tenn., as I did rock acts on Detroit & Ohio TV. In college one of my music classes was w/ Raymond McClain of the McClain Family. but how trad musics can keep abreast of times while retaining their roots. BTW, that firecracker on mandolin is Donna Stoneman. I posted this in another forum, that too, was mentioning bluegrass GUITAR! And this too, does have(to me) that bluegrass "vibe"
I started out with NOTHING...and I still have most of it left! I play bluegrass but not on guitar. I play Dobro and bad to mediocre Scruggs style banjo. I haven't touched my mandolin in years. I'm mostly a Dobro guy when it comes to Bluegrass. I'm mostly a Dobro guy when it comes to Bluegrass. We always considered the Dobro player a guitar picker. Indeed, hard to know what else to call it. I've always called them a dobro (generic term) or a slide player...most of them play square neck dobro and the resonators don't sound the same as the lead, flat picking or chording on a regular acoustic guitar IMHO. As an aside. The father of the Bluegrass dobro is Buck Graves. Buck was original the bass player in the Flatt and Scruggs band. (Foggy Mountain Boys). He asked Earl Scruggs to teach him his 3 finger picking style and apply it to the Dobro. So Earl Scruggs in addition to creating modern Bluegrass banjo created Bluegrass Dobro. Of course, the girl here isn't the one I know. As an aside. The father of the Bluegrass dobro is Buck Graves. Buck was original the bass player in the Flatt and Scruggs band. (Foggy Mountain Boys). Well, people will play whatever in any way they wish. Ain't that da troof ! & finally, getting back to J Graves, check the position of his R arm & the gtr strap. Was that a tactical decision to keep the gtr from shifting position ? Well, thanks for the effort to show me something I was already aware of, but I appreciate your taking the time! Liked that 1st clip of d's up there with the Japanese "pickers" putting their instruments behind their heads(ala Hendrix)! I didn't watch the whole thing, so later I'll go back and see if they next try to play them with their TEETH! HEALEY'S always fun to watch(and listen to!) and up until I first became aware of him 'bout 10 years ago( on some PBS program) he was already dead. And also up until that time the only other guy I saw play in that manner besides Kenneth "Thumbs" Carlille. "Upside down" suggests(to me) that the guitar is flipped over to the "lefty" playing position, or in this case, the Dobro or "lap" steel guitar, while still hanging from your shoulders, is flipped over so that the strings are facing the floor, requiring you to reach underneath to get at 'em! Under the strap is just the way you do it. It just doesn't work over the strap. You can't get the hand position right. Forearm needs to run parallel along the guitar top and the hand angle has to be where the picks hit the string at the correct perpendicular angle. One of the first hurdles a player needs to over come when he starts out is not striking strings at glancing angles. Are Long. Standard straps don't work. A nice leather strap is practically a must. They cut into my neck. If I play a dobro gig it's in a Country band where I'm the steel player. I just play seated on my my bench and just back away from the pedal steel. I play better seated than standing. I think I paid $65-70 for my Old strap and I hardly ever used it unless it is an impromptu bluegrass jam. The great thing about Bluegrass is how festival shows work. Generally there will be marque concerts that people will be there to see. Many times the musicians in these bands that can melt your face off will mill about the playing rooms or surrounding area if it's outdoors. It is not totally unusual to find yourself in a playing circle with some of the most famous best musicians in the world. Last year my friend found himself playing in a jam circle with Michael Cleveland. One of the best Fiddlers in Bluegrass. It's like if Rock Musicians took their instruments to Rock Festivals and all around they would cluster off and start jamming and guys like Jeff Beck and Eddie Van Halen would wander and join in. 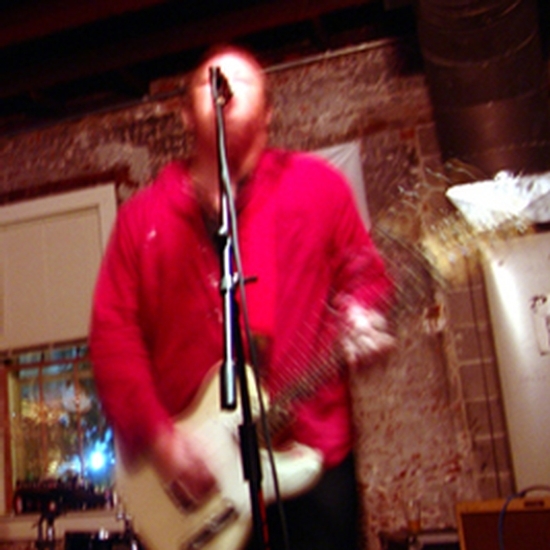 "Upside down" suggests(to me) that the guitar is flipped over to the "lefty" playing position, or in this case, the Dobro or "lap" steel guitar, while still hanging from your shoulders, is flipped over so that the strings are facing the floor, requiring you to reach underneath to get at 'em!" Fang. That's Not at all what I'm referring to Fang. The square neck Dobro is played like a lap steel with a bar not upright like a guitar with a slide or bottle neck. However I have seen it done with a square neck and will post a video for you so you can see it for yourself. Notice when you watch a dobro or lap steel that they use a bar and play from the 6th to the 1st string while laying flat (or over the top like in the Junior Brown video I posted above). When using a bottle or slide and holding a square neck upright (as you described like a guitar) you will be going from the 1st to the 6th (upside down from underneath the neck). The reason blue grass players wear a strap as CEB describes, is they can stand up and play with the square neck doro laying flat like it's supposed to be played using a bar. Thus they can get close to the mic. Lots of bluegrass bands play acoustic and share a central mic. They step in close when playing lead and then back out. Many have mics for each instrument as well. Anyway here is a square neck being played as a round neck...it would be difficult to try and play one in the upright position coming over the top with a bar. You have to come from the bottom (i.e. upside down so to speak) if you want to play one bottle neck style. Not as you imagine with the strings facing the floor LOL! So that's a standard method w/ the strap ? As a kid, I saw a lotta dobro players---not so much since ---but I'd never noticed that. Per the music fest open jams, I dig...in fact similar open performance situations used to be the way many pop/folk fests operated. I've read of Pete Seeger, Joan Baez & even the Dyl dong workshops at Newport Folk. Yes. You need to either run the arm under the strap or over the strap. In order to be able to Palm mute and hit with proper picking angle and keep everything relaxed I don't think you could do it any other way. Your forearm on the top can give you some control over the angle of the guitar. It's the only way I've ever done it. 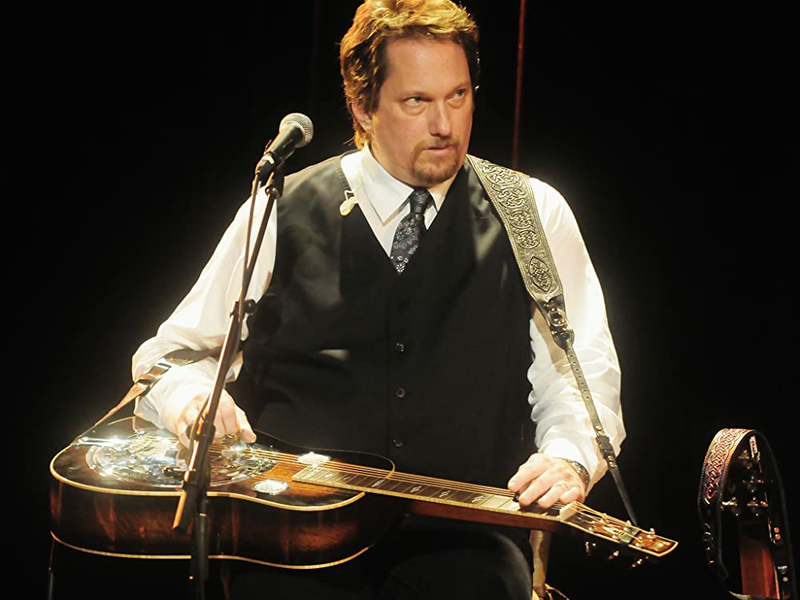 Here is a picture of Jerry Douglas. BTW, CEB, Thanks for the concurrent J Douglas thread/rig rundown ! I KNOW what you were referring to, All I was doing was facetiously pointing out what your phrase "upside down" could also be taken to mean. DAMN! If you ain't the life of the party! Flip that axe "upside down" and where would the strings be facing? Ever go to a show, get something stuck to the bottom of yer shoe & not be able to scape it off ? Fang, take a look again at the two pictures CEB posted of what a real blue grass player looks like playing a "Bluegrass Guitar" style of dobro. That's kind of what the thread topic is about and that's all I was trying to comment on. You can play a Tele on your lap, or a Dulcimer as a guitar, or lap steel at the bluegrass jam. Or you can turn the square neck Dobro up and play it bottle neck style and be "the life of the party". Or turn the strings toward the floor and play it as a bongo if you want to...Don't get hung up on the "upside down" comment as it has to do with square vs. round neck and bar vs. slide or bottle neck...I'm just not acknowledging the concept of being an unconventional dobro player at a bluegrass party. "Slide OR bottleneck"??? OK.... So, do you drive a CAR, or an AUTOMOBILE? Yeah, I know you're referring to the choice between the heavy chromium bar held in one hand and versus the hollow metal tube(or glass, like mine) one slips over a finger, so don't go off 'cause I like to slip this type of ribbing about the way you tend to put things. Mean nothing by it, and since this place isn't really a "tutorial debate", a little levity helps keep the head from swelling too big. Over many years I've seen(both live AND on film, tape or otherwise on TV) plenty of bluegrass bands, and somehow managed to NEVER see a ONE of 'em with a guy playing a DOBRO until maybe the last 10 years or so. Which really don't mean much except only "luck of the draw". The ones I'm more familiar with have a bass( sometimes called a "bull" fiddle), banjo, mandolin, guitar and (sometimes) a fiddle. Mostly though, like THESE guys! "Josh Graves (September 27, 1927 Tellico Plains, Monroe County, Tennessee – September 30, 2006), born Burkett Howard Graves, was an American bluegrass musician. Also known by the nicknames "Buck," and "Uncle Josh," he is credited with introducing the resonator guitar (commonly known under the trade name of Dobro) into bluegrass music shortly after joining Lester Flatt, Earl Scruggs and the Foggy Mountain Boys in 1955. He was inducted into the International Bluegrass Music Hall of Honor in 1977." I remember the Dillards on Andy Griffith and always admired their performances when they visited the show. You nailed it as far as the usual instruments in blue grass bands, but the resonator added a ton of vibe to the genre IMHO. BTW automobiles are made of glass and steel. For bottle necks and slides you'll have to make a choice...In addition to sticking your finger inside a bottle, brass, steel, ceramic, etc. tube vs a bar, you'll find your hand position on the fret board changes from the top down using a bar laying the guitar flat and from the bottom up using that slide playing the guitar in the upright position. To my knowledge, the first slides were invented in Hawaii and were made of steel...no swollen fat head here, just my 2 cents. ...levity helps keep the head from swelling too big. The diff between actually taking the advice & just dishing it out to others ? I was thinking in "terminology" realms. For instance, I don't know if all along that the "Hawaiian" style of guitar playing was ever or always referred to as "slide" or not. Now, the stuff that old blues players did WAS done by placing the broken off neck of a beer or wine bottle( hence the "bottleneck" moniker)over a finger and then moving it up and down the guitar's neck. Over time, some guys got "inventive" and started using short lengths of pipe, or those metal lipstick tube covers from their women's lipstick. Anything else that could be used in that manner. And too, I mentioned in earlier discussions, that music critic STACEY WILLIAMS( an alias of NY times writer ROBERT SHELTON) in the liner notes of BOB DYLAN's debut album called the technique "fretting". Have NO idea what the HAWAIIANS called it. I think generally the name applied to "Hawaiian style" gtr (developed from imported Mex farm workers) is "slack key". THESE SOUND LIKE BGRASS TO ME / WHADDA YOU THINK ? The technique of using a hard object against a plucked string goes back to the "diddley bow" derived from a one-stringed African instrument. The "diddley bow" is believed to be one of the ancestors of the bottleneck style. When sailors from Europe introduced the Spanish guitar to Hawaii in the latter nineteenth century, the Hawaiians slackened some of the strings from the standard tuning to make a chord—this became known as "slack-key" guitar, today referred to as an open tuning. With the "slack-key" the Hawaiians found it easy to play a three-chord song by moving a piece of metal along the fretboard and began to play the instrument across the lap. Near the end of the nineteenth century, a Hawaiian named Joseph Kekuku became proficient in playing this way using a steel bar against the guitar strings. The bar was called the "steel" and was the source of the name "steel guitar". Kekuku popularized the method and some sources claim he originated the technique. He moved to the United States mainland and became a vaudeville performer, later performing in Europe for several years. In the first half of the twentieth century, this so-called "Hawaiian guitar" style of playing spread to the US. Sol Hoopii was an influential Hawaiian guitarist who in 1919, at age 17, came to the US mainland from Hawaii as a stow-away on a ship heading for San Francisco. Hoopii's playing became popular in the late 1920s and he recorded songs like "Hula Blues" and "Farewell Blues". According to author Pete Madsen, "[Hoopii's playing] would influence a legion of players from rural Mississippi." Most players of blues slide guitar were from the southern US particularly the Mississippi Delta, and their music was likely from an African origin handed down to African-American sharecroppers who sang as they toiled in the fields. The earliest Delta blues musicians were largely solo singer-guitarists. W. C. Handy commented on the first time he heard slide guitar in 1903, when a blues player performed in a local train station: "As he played, he pressed a knife on the strings of the guitar in a manner popularised by Hawaiian guitarists who used steel bars. The effect was unforgettable." Blues historian Gérard Herzhaft notes that Tampa Red was one of the first black musicians inspired by the Hawaiian guitarists of the beginning of the century, and he managed to adapt their sound to the blues. As an example, Tampa Red, as well as Kokomo Arnold, Casey Bill Weldon and Oscar Woods, adopted the Hawaiian mode of playing longer melodies with the slide instead of playing short riffs as they had done previously. Bottle neck has more to do with the style of playing the guitar in the upright position than the material the slide is made out of IMHO. I have a buddy who is big on playing bottle neck and he likes to correct me when I refer to a resonator guitar as a Dobro. Dobro is actually a brand name that has become generic for a resonator guitar. The square neck resonator is another style of playing with the guitar laid flat using a bar the same as a lap or pedal steel. I'm not the history buff he is and I really haven't used or learned to play my square neck yet. I have fooled around with it and can play a little. Nowhere near enough to play in a bluegrass band LOL! I guess some would rather debate the fine points of the past (a debate that can't be won when one end of the scale admits that they "have no idea" ). We gonna get stalemated by that or consider what the future of this musical style might hold ? That's cool, LZ, & fits with the generic, style-defining vids I posted just above. Not just an illustration of the style but an analytic suggestion of what/how. Here's a couple clips that followed that one. Each adds something to my understanding of the tradition but also show how it's moved a bit forward. This one explains how a master player makes some choices. But at risk of repeating myself, I'd like to consider not just the past but the future & ask where one takes a music style or if some music styles can be taken anywhere. We know the blues, for ex., has managed to evolve & stays with us today in ways that are both trad & modern. These sound like bluegrass to me. What's everyone else think ? I think the water is always purest closer to the well. I think traditional Blue Grass, Blues, Jazz, Country and Rock and Roll will always be kept alive. I also think each of them have been and will continue to be revisited by players from other genres. Like classical masters from way back finding their music incorporated into today's Rock. I love doing my own take on old classics but always try to pay homage to the gist of the original. In the clip I posted, he talks about freedom to improvise in the Blue Grass style, but I think he does it in such a way that lets him fit in with the old guys...that's the direction I like to see. Blue grass players are masters at improv IMHO. Well not only incorporating classical music in today's "rock", but too it's still getting played as originally written and intended. And millions of people worldwide still flock and gather to hear it that way! ELP were MASTERS at not only "incorporating" classical themes into the "rock" genre, but making rock tunes OUT of them as well! Going back to the source is always good. However, the fact is that any art or music form that doesn't advance in some ways is inevitably doomed to death. Consider European classical music if it never advanced beyond Bach to Mozart, Beethoven, etc ? Dead & never reaching its potential. Jazz if it had ended when Dixieland zealots tried to end its advances of BeBop, Cool, Fusion, etc ? Blues if nothing was new after 1950 ? Rock if had stopped w/ the 1950s cats ? In each case, dead & never reaching its potential. To advance a music doesn't obliterate its essence; to do so is what keeps an art form alive, actually. Otherwise it becomes a museum piece subject to re-enactment but not a living form. BTW, has anyone considered the 2 trax above in a BGrass context ? As for ELP, none of the above has anything to do with what I'm suggesting (or even what the poster suggests, really). It's always interesting to see how threads take twists and turns. But, if it's amplified, it ain't bluegrass. And we don't 'low no drums. @ Fang, Beethoven could hear up until about he age of 21...I'm sure he would have liked a ton of our way back machine music, if it was around during his lifetime, to include modern versions of his music...for Roll Over Beethoven, I prefer George Harrison LOL! @ d, I don't think you advance any musical genre by obliterating the original concepts. Having those museum pieces around to relate back to, gives meaning to the genre IMHO. I would agree that the "living form" can be a good thing and advance the art form, but it can also provide a certain amount of crap at times LOL! @ Doc, I get a kick out of Bluegrass anti electronics puristos! It's amazing to see how many are using instrument pickups as opposed to pure acoustics playing around a central mic...speaking of mics, I was amused when I attended a bluegrass festival and while all the bands were on break, the stage had all kinds of mics and stands sitting there plugged into PA speakers and mixer boards, etc. There is a lot of electronics involved in getting that pure sound out to an audience. also, on not allowing drums, there was a time when drummers played behind the curtain and were not allowed up on stage. Elvis was one of the first to bring DJ out from behind the curtain and put him into the act where everyone could see the drummer LOL! I know what you mean though as you don't see drummers in bluegrass bands. Maybe this is the new direction that d might like to see someday? just a few comments, not wanting to start any controversies LOL! Larry, you tickle the hell outa me! Bringing up GEORGE HARRISON in a short discussion and example of "incorporating" Beethoven into modern music! And worry not, ELVIS is in that "chain of command"
@ Fang, And while you're [Chuck-a-ling], don't forget "to tell Tchaikovsky the news!" Chuck Berry was responsible for "incorporating" Beethoven and Tchaikovsky into Rock and Roll lyrics, I just followed a little bit of OT from Bluegrass guitar and don't forget that Ludwig got his name put on a lot of bass drums too LOL! Someday maybe someone will come along and change the landscape of bluegrass guitar in much the same manner as all of the other greats...but if you don't keep some of the roots, no one will know it was bluegrass IMHO. d, I don't think you advance any musical genre by obliterating the original concepts. Having those museum pieces around to relate back to, gives meaning to the genre IMHO. I would agree that the "living form" can be a good thing and advance the art form, but it can also provide a certain amount of crap at times LOL! A mistaken reading of my points. Abandoning the original sources isn't at all part of it...although in any music that lasts long enough those recede (heard a Moon Mulligan or Little Richard cover lately ?). & crap doesn't only happen via later additions but is there in any art from the get go. But to make it clear, any form that doesn't advance inevitably becomes a dead museum relic...& then the original wellspring is gone anyway ! It's kinda like "I loves you so much, Baby, that I'll kill before I share you with anyone or let you change". if it's amplified, it ain't bluegrass. Uh, how ya'll hearing that stuff anywhere/anytime ? :"incorporating" Beethoven into modern music! However the examples posted above were legit instances of adapting anything. They were examples of exploiting something for promotional effect. I'm sure the poster would love to continue to argue that point but that it itself would be another diversion from the actual point of this thread, eh ? Therefore unworthy of further response. @ Doc, interesting article. I didn't do a full read but I got the gist of it. It also covers a little of what I was saying about the electronics/PA involvement and/or the circle around the mic, and the circle of the crowd up close around the musicians that gets to hear the [true blue] (my new term for it). Then the up close crowd muffles the sound for the rest of the audience. Getting the acoustic sound as true as possible out to a large audience takes some very good soundmen and equipment. I foresee instruments running special pickups and/or special mics going direct into stereo PA's using XLR inputs. Scott could be the best one out here to tell us how or if this could be how we get to true blue. Banjo is loud compared to the acoustic guitar and so is a resonator guitar. The bass is never loud enough for me. The violin is nice and loud...harmonicas are loud (although I never see them used much), mandolins need more volume. Vocals cut through just fine. I know volume is not everything and getting a true blue sound might just keep it the way things are now LOL! I think sound equipment could equalize things quite a bit and we will see more electronics in the future...maybe even a drummer LOL! "As bluegrass music prepares to enter the 21st century, and as urbanized versions of traditional music face new audiences, the issues of amplifying and plugging in a bluegrass band remain areas of controversy between the progressive and conservative factions of the bluegrass community. At the same time, new tools and technologies are helping musicians bridge the gulf between under-amplification and over-amplification, and the issues and choices are changing every day." I don't know how I could state it more clearly than I did already. To advance doesn't mean forgetting the past. Advancing is what keeps the past alive rather than dead. As to the issue of BGrass amplification...in fact that's as irrelevant, I think, as saying you couldn't use certain instruments. The tools aren't the music. It's Bluegrass. Using individual amplification isn't an advancement. I have Fishman electronic pickups and preamp DIs and amplification in/for my banjo/Dobros/Acoustic guitars because I don't play bluegrass. I'm always working with electric guitars and drums. If I played bluegrass though I would ditch all that and work off the condenser mics because that is what works best. The dynamic of banjos, fiddles, mandolins, Dobros, guitars, and bass are all different. Banjos are loud, Mandos not so much. There's no money in Bluegrass so you don't travel with full production like Rock and Country gigs. You want to play off a mic just like vocalist like to play off a mic. Many singers hate headset mics because they can't escape them. A bluegrass band mixes it's self by changing their positions relative to the mic. Direct amping or DI int the bass is cool. Bass usually Isn't a solo instrument and is sometimes hard to hear. You don't need an very active soundman on the FOH if a Bluegrass band knows how to play together and your players have good touch. Also a good condenser sounds way better than transducers, piezo elements and magnetic pickups. You can't use a condenser in an electric band the bands are too loud. We are on two different wave lengths d. For instance I do not hear bluegrass guitar in your Luca Stricagnoli or your Ewan Dobson videos. You do. Perhaps you have the better ear. I do hear Bluegrass guitar in the video(s) I posted, neither of which are sticking to traditional blue grass guitar and promote improvisation within the genre. I also hear more bluegrass in the 1st Tony Rice video and not as much in the 2nd. He is a fantastic guitar player either way IMHO. I agree that Blues has evolved and changed and stayed with us both old and new. The museum pieces are still there and have been revisited countless times. To answer your question (i.e. what about blue grass?) I'm not saying you are throwing out the baby with the bathwater and I think Bluegrass has evolved and will continue to do so. Both traditional and modern. ps. like CEB, I don't play bluegrass guitar, but I appreciate those that do. I think a few of my little country lead runs could fit in but I'm not a bluegrass or country flat picker...I prefer being plugged in so I stay clear of the BG genre. I will jam with BG pickers anytime they invite me to. I have played with a couple of BG friends here and there and have had fun playing with them. They are truly talented. And somewhere else I made comment that; "there's got to be some respect for tradition. After all, with the exception of some electronics in the form of keyboard synths and the like mixed with all the acoustic strings and such in orchestras playing contemporary orchestral music(ie: Loren Rush compositions, etc. ), but most symphony repertoires are still played with non-electric instruments." I'm reluctant to tell ANY musician in America, and who's over 21 years of age( or even UNDER far as that goes) that they shouldn't play any music they want to any WAY they wish to. But too, I also have the choice to NOT listen to it if I wish not to! I'm a believer too in freedom to do as one wishes. I can see playing bluegrass on a Tele or any other guitar. I don't change the guitar I'm playing for each genre. If you can make it sound good, go for it. You may not fit in with a Tele at a traditional bluegrass jam even if you are over 21 LOL! Same goes for jazz but they are more accepting of solid body guitars instead of the big jazz boxes these days. Joe Pass started out on a Fender Jazzmaster (even though it didn't catch on in the jazz world). A lot of how one fits in has more to do with the look. That includes the way one even dresses for the jam. I think more and more instruments will be added to the bluegrass world, but the old acoustic guitar will continue to be a workhorse and a custom fit at any of today's bluegrass jams. @Larry I think that's why the terms Americana and Newgrass were created. It's just the traditional acoustic instruments that define Bluegrass as we know it. When we play amplified, we refer to it as Americana which includes all of the'Roots" music. Blues, Folk, Bluegrass, String Bands, etc. @Larryz. Yes, Marty Stuart dropped by the Carl Tipton Show a few times. With Johnny Cash. They were best friends for sure. Carl's band was my first job as a musician and definitely Bluegrass. @ Doc, you're a lucky man for getting to work on that show and meeting some of the big guns! Yep. Some people feel hey gotta come up with ANY kind of label, fitting or not. And some of them don't necessarily have much to do with any kind of different genre, like "Americana" which sounds like old folk and folk-rock to me, or "Indie", which hints at referring to"independence", but mostly( to me) sounds a lot like the kind of "underground" stuff we'd listen to on the fledgling FM stations back in the late '60's. Those clips are too high tech. Everyone had their own mic and guitars are plugged in. I was talking about everyone but the bassist using a single mic. If We do not have a sound guy out front then this is still the way I prefer to do it. This way always works. I watch every live clip I can find of the various incarnation of Bluegrass bands involving Tony Rice, Jerry Douglas, Sam Bush, Bela Fleck, Mark O'Connor . These guys are the elite playing the best gigs and you find instances where the sound guy was sleeping and a soloist is Several bars into a solo before you can hear him. You are correct CEB and I have mentioned the same thing in earlier posts (i.e. playing around a central condenser mic and/or having individual mics). Each guy stepping up when his lead comes in as seen in your video. Marty and the boys are just doing a guest appearance and getting away with plugging in at a Bluegrass festival. They usually play more country rock using Telecasters. I have seen him live doing the mandolin solo telling the story in the first clip, and all 4 including the drummer do come down as seen in the BG clip. I'll bet they were the only ones at the BG festival that plugged their guitars in! But, I thought it was well accepted by the audience who usually prefer it through a central condenser mic and with the individual mics that you see on stage in the vid...Only Marty could get away with such a breach of BG protocol LOL! +1 it's too high tech in the BG world, but the methods Marty uses to amplify the instruments may lead to some future concepts in the BG world...When they come down front at their normal gigs, they are all using cordless transmitters which you will see on the snare if you look closely at the end of the BG vid and you'll see one on the bass as well. Usually they don't have cords on the guitars and that was something special to see in the clip which shows they were plugged in. I took to rockabilly as a kid (there was a bit of a local scene) and could play those riffs and in turn a bit of "chicken-pickin'" country rock in the James Burton style, but a while ago I got hired to play acoustic guitar in a play and one of the songs I was given to learn was an acoustic version of "Will The Circle Be Unbroken," which terrified me... bluegrass isn't part of my heritage or cultural milieu... I shedded on that a lot to get some of it down, then it turned out all I needed to actually do in the play was a very brief introductory riff that they thought I nailed the first time... whew! I know Doc Watson said bluegrass was "what happened when the radio carried jazz up the mountain," but... jazz included bits for the horn players to breathe and that worked it's way into how the guitarists and pianists and the rest of soloists phrased things. Bluegrass is perpetual motion in the hands of the greats... It's something I try to work on for the challenge, so these links are great. Thanks! We have to keep in mind that the lead instruments in Bluegrass are fiddle, banjo and mandolin. The fiddle and Banjo have sufficient volume unamplified to fill a big room. Even in a small outdoor venue, these carry well. So the mandolin player could use the PA system along with the vocalist. The guitar is just a rhythm instrument. I think all that's beside the point. It's beside the point for those who want to use any particular gear & play the music they desire. It only matters to those who want to establish some restrictive rules abt the music. Those who actually care abt the music itself are concerned only with the music. This particular form was deliberately created as a sort of hillbilly jazz. Many traditionalists disliked it ("too busy", "too modern"). Now, in a way that seems exactly like what old-line Dixieland jazz fans, there are those who oppose any changes or alterations of what they like &/or understand. That seeks to make any musical form a musem piece rather than a living, growing form. That's a valid point but it only really switches between terms...the equivalent of saying Blues Rock or Jazz Fusion. If that makes it palatable to someone, OK, but it's' really just quibbling over a name & kinda beside the point of any musical quality. This idea seems to me even less relevant as per music. That's just abt the overall EQ tonality. Kinda like "Lester & the boys / Phil & Don / John & Paul only sound right when the're singing into the same mic" or "CDs don't sound like vinyls LPs don't sound like my reel-to-reel". Regardless of some cats moving up to or back from a mic or decrying modern sound repro, that's a sound timbre question, not one of music. I think the idea htat some instruments can't be part of the picture or that the imge is more vital than the evolving reality is the epitome of anti-modernity. "Yo, Gtr Boy, no soup for you !" So here he is with some of his local boys getting some of that Bluegrass "sound"
Thanks for bringing Presley up. Great story. As an aside. The father of the Bluegrass dobro is Buck Graves. See my "vent" in the other forum concerning "Dobro". Yeah, people who don't play Dobro complain about that sometimes. And everybody calls the steel a Stevens bar even though many don't use a Stevens brand bar. I usually use a Long Dawg. But I call it a Stevens bar. True CEB. I didn't know National was a brand until the 60s. I usually only called it a "bar" if I bothered to call it anything. I doubt that "everybody" called it a "Steven's bar". Probably most who played lap steel or pedal steel guitar, I'm willing to bet. But I'm guessing because when I was in a band, I played Kalamazoo, not lap or pedal steel guitar. Back in "The day"( whenever that was) I remember a lot of guys trying to get that sound by just using their ZIPPO LIGHTERS. I mean, WHY waste money on a SPECIAL BAR, when you got something that works just as well in your pocket? You mentioned the Zippo once before (can't remember which thread) and I went out to the garage and found my old Zippo and gave it a try LOL! Since I quit smoking back in '99, I quit carrying it around and having it handy...I have used a long neck Coors bottle for bottleneck style and even my mic stand on stage LOL! This thread's abt "BG gtr". Doc, a staunch traditionalist, has suggested that, despite his own title for the thread, the gtr was not originally a lead instrument in the style. Did the dobro come to prominence as a way for bands lacking a fiddler to mimic that sustained, pitch-bending sound ? CEB has already mentioned Josh Graves who was the first to bring the resonator guitar to Bluegrass. I spend the vast majority of my time in open G but I've taken to putting a 58 phosphorous bronze string on the bottom so I can drop it E ( E B D G B D ). That gives me both full major and minor grips and some really neat voicings. A standard 56 will work but it's a little floppy. There was a time(a LONG time too!) that the guitar wasn't a part of ANY jazz band, the BANJO put to use in them( Louis Armstrong's Hot House Five) before the guitar was ever considered. And how long WAS it before any COUNTRY/WESTERN band employed a guy beating on a DRUM KIT? Take this scene from '65's movie YOUR CHEATIN' HEART. about Hank Williams. Dig what RED BUTTONS is playing! They are called Dobros because that is the vernacular. That is just the way it is. People down here call all cola Coke also. The Bluegrass guys played Dobros because Dobro had the spider bridge and Tricones and biscuit bridges sucked for Bluegrass. I play a Recording King and Beard dobros. +1 CEB, the Dobro was invented in 1929 and was not used in bluegrass until the 50's. They were invented to make the guitar louder without using an amp (not for slide). They were discontinued in 1941 due to WWII as the metal was needed for the war effort. Mosrite bought the name for awhile. Later in the 90's the name was bought by Gibson. People started calling them Dobros a long long time ago and it became the generic term that it is today. You just can't use the logo. The resonator designs have changed now and then...but we pretty much call all of them dobros. I have a buddy who has played one bottle neck style for many decades and he always wants me to call one a resonator...The original idea is a similar idea to the archtop guitar (i.e. being used to increase volume in jazz bands). Us country folks couldn't pronounce Dopeyra so we just called them Dopros or Dobros. We ALL know "DOBRO" is a mish-mash of DOPEYRA Brothers. Dopeyra Brothers.... Sounds like a bunch of Yankees. Actually, all 10 Dopeyra siblings were mostly Slovakian. However, the name DOES remind me of DUPA, the Polish word for one's backside(buttocks). Did Hasbro ever make a Dobro? Seems a shame if they didn't! ....BTW, are you talking abt the tuner for the high drone string on the banjo ? Larry, I've seen Earl do that trick on several TV shows and such over the years. And it's always amazed me that he turns that string back in tune with NO NEED to take any extra time to carefully make sure! I'd have to stop everything for at LEAST a half-minute to get it properly back in. And it warmed my heart to see that MARTHA WHITE flour poster in the back. My wife made the BEST biscuits ever and insisted on only using that brand of flour! Adrian Legg does that on his Ovation, which has been fitted with banjo tuners. I thought it was a special sort of tuner which gives you an exact half step down or up with a quick quarter turn. So presumably a fine tuning aspect is included. Scrugg tuners. Now most use Keith tuners, his take on the same principle. The tuners have setable stops just like string benders or a drop d-lever do on guitars. I used to think Flint Hill special was on the 1949 record and Earl did that before he invented the tuners ..... But I was wrong. He is good but he didn't do that. what's the deal w/those tuners ? Are they set to specific intervals ? They are a standard banjo tuner except they have two set screws on the back. One stops the tuner on the top pitch and the other sets the pitch on the bottom note. The interval is whatever you make it. Country guys will put them on Teles sometimes. Clarence White's old Tele that Marty Stuart plays has a banjo tuner on the low E string. Wish I could help d / halfnote. I'm not a banjo kind of guy and I think CEB can provide better info. Marty Stuart has two Scruggs tuners on his Telecaster on the 1st and on the 6th string along with a B bender. I think in Earl's case, seeing it's an old clip( or rather, a clip of an old performance) that it's his skill and experienced ear. M'man CHRIS SMITHER uses a wide variety of alternate tunings which he routinely changes several times a performance. And does so without any special or specific tuning devices, just a sharp ear. Nah, that clip LarZ posted shows that it's automatic. He didn't pause for a moment to hear the pitch or tweak the turn.